Keep updated on all the injury news and roster moves from around the NHL with daily Ice Chips. - Ryan Strome moved to the wing on the second line from third line centre. - Kailer Yamamoto remains on top line after his best game to date Saturday. Also on top powerplay unit in place of the injured Leon Draisaitl. - After healthy scratching last game, Matt Benning back on second defensive pairing with Kris Russell. - Draisaitl remains out with concussion/eye issue. - Drake Caggiula is on injured reserve. Neither player will play tomorrow against the Carolina Hurricanes and both will be evaluated tomorrow to see if they can go on the upcoming road trip. 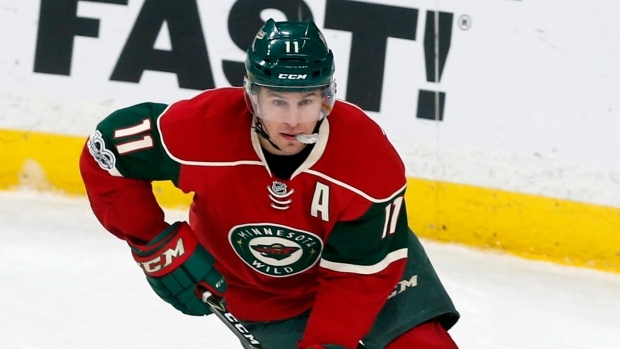 According to The Athletic Minnesota's Michael Russo, Zach Parise (undisclosed) suffered a setback and left Monday's practice early. Head coach Bruce Boudreau said he didn't know how much of a setback, but Parise apparently felt great before practice. According to Mike Harrington of the Buffalo News, Kyle Okposo (illness) may be be back in the lineup for the Sabres' game against the Vegas Golden Knights on Tuesday. According to Isabelle Khurshudyan of the Washington Post, defenceman Lars Eller missed practice because he was feeling ill. However, the team doesn't play until Tuesday against the Maple Leafs, so if Eller is feeling better he still may be eligible to play. Lars Eller is not at practice because he's ill.
Jim Thomas of the St. Louis Post-Dispatch reports that head coach Mike Yeo said forward Jaden Schwartz missed practice due to food poisoning. Yeo says Jaden Schwartz was held out of Monday practice due to food poisoning. The Blue Jackets announced that Gabriel Carlsson (upper body) has been placed on injured reserve. He is currently listed as day-to-day after suffering the injury Friday against the New York Rangers. In a corresponding move, the team called up Markus Nutivaara from the AHL's Cleveland Monsters.